The Tales Of Tori: The TWILIGHT Zone! This post is WAY over due! I can't believe it has taken me this long to post about this! 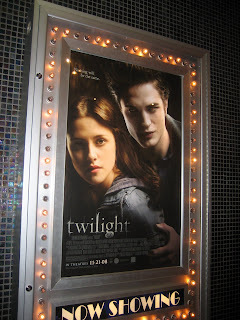 All the girls in my family have read the Twilight series and we all were so anxious to see the movie, and especially to see Edward Cullen come to life! :) So what does this mean? 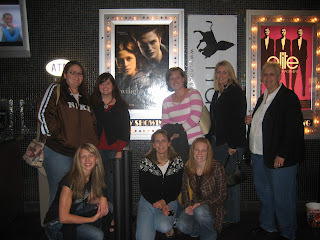 Twilight movie = girls day out! After much anticipation, (and buying tickets in advance online) Momma J treated ALL of us gals to the movie and dinner at the ever so tasty California Pizza Kitchen! It was the first time in a long time that we were all together...mom, sisters and sister-in-laws. It was a great night with great memories and the movie wasn't too shabby. I must say that I thought it was better the second go around, probably because I knew what to expect. All in all, I give it a 7.8 out of 10 haha, just cuz I feel like it. 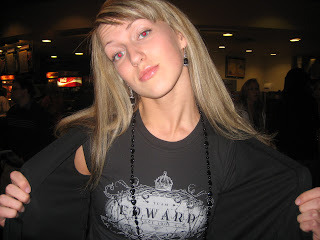 My amazing T-shirt that reads: "Team Edward, established 1907"
Holy crapinoli Tori your hair is getting so long! Anyway, haven't brought myself to see it yet! But I want to pretty bad... I hear the acting isn't too good? I don't care if it doesn't follow the book like it should - I usually can treat books and movies completely different! Anyway, lovs! Wonderful post! Cute! Miss you gorgeous ladies! I still need to read those books :) Maybe that will go on my Christmas Break to-do list! Love u Tor!